Catching the tail end of eggplant the season, this eye-pleasing dish showcases the juicy late summer (or fall) vegetarian favorite. I previously posted a couple of my grandmother’s vegetarian dishes. Paula Peck was not known for cooking vegetables and when she did, there were often whole sticks of butter or cups of olive oil involved. As a veggie lover though, I’ve managed to revise some of these dishes so that the flavor is maintained, but with less fat. 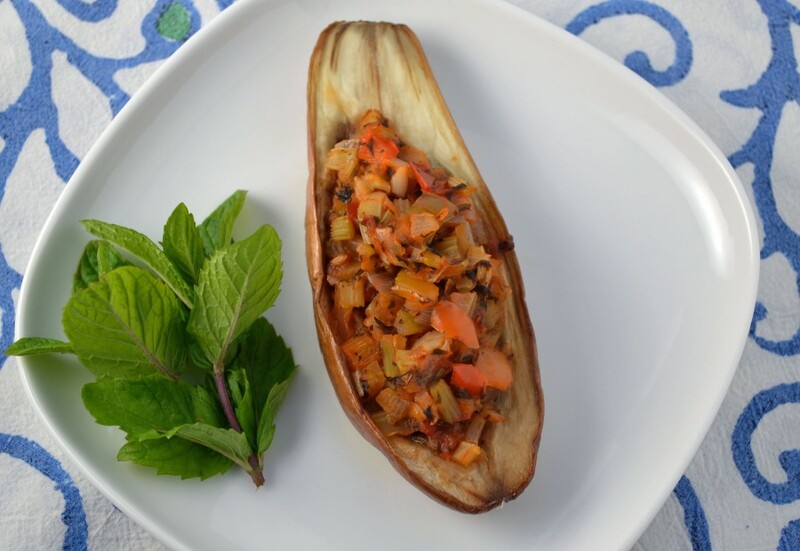 In this case, the eggplant is stuffed with a fragrant mixture of garlic, onion, celery, tomato puree and herbs. These flavors soak into the eggplant as it roasts with just enough olive oil to keep it moist. The resulting succulent meaty flesh will make you forget that you’re eating an almost guilt-free and healthy dish. So what does this strange recipe title “Imam Byaldi” have to do with eggplant? Well according to my grandmother’s introduction to this recipe in “The Art of Good Cooking,” the old Armenian title means “’the Holy Man fainted’- of shock because the eggplant tasted so good!” Ok so nobody is going to faint when they eat this stuffed eggplant, but it is pretty tasty. Cut eggplant lengthwise into halves. Salt cut sides generously and let stand for about a 1/2 hour (this draws out the bitterness from the eggplant). Preheat oven. Rinse eggplants and dry with paper towels. Brush cut sides with some olive oil. Place eggplants on a baking sheet, cut side up. Bake until centers are soft and lightly browned. While the eggplants are baking, prepare the following stuffing: sauté onions, green pepper, celery, and garlic in remaining olive oil until vegetables are soft but not brown. Add chopped celery leaves and parsley. Stir until leaves are wilted, then add tomato puree and herbs. Add sugar then salt and pepper to taste. Cook a few more minutes. Set stuffing aside until needed. When eggplants are tender, allow them to cool so they can be easily handled. Raise oven heat to 350 degrees. With a small knife, make an incision lengthwise, down the center of the cut side, being careful not to cut all the way through the eggplant. With your fingers, press soft pulp away from the incision on the 2 long sides so that a good-sized hollow is formed. Fill the hollows with the prepared filling, using a spoon. Arrange stuffed eggplants on the baking sheet. Sprinkle with additional olive oil if filling looks dry. Bake for 45 minutes, basting with olive oil as necessary. Note: To speed up this recipe, cut eggplant 1/2 inch thick and after it has been baked until tender, place slices of eggplant in a casserole. Arrange them alternately with the stuffing. Bake 30-40 minutes.